Yarrow weed contains essential oil, tannin, flavonoids, various mineral salts. 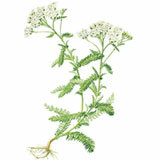 Yarrow extract is known for its skin regeneration properties. Essential oil containing azulene has an antibacterial and antiinflammatory effect.